Gilas finally won a game they had hard earned against Senegal with scores 82-79. Though Gilas is already out for the next level of 2014 FIBA World Cup, fans and players could not contain their joy for the most awaited elusive win. During the first half of the game, Gilas led by 13 points, but with experience, Philippine team did not became confident. With the upper hand, they tried hard to keep the lead, but Gilas started to miss more shots. At less than five minutes before the end of the game, Senegal was able to pass the defence of Gilas and made the score 58-57. Just like the previous games, Gilas started well ahead of the opponent only to bow at the end. This point in the game made it both heartbreaking and exciting for the Filipino fans. With Fajardo’s dunked, he was able to turn the tables, gain back the lead and get into the defence. Then this was followed by Blanche’s layup making the score 64-61. It was less than 1.5 minutes when Senegal called for a timeout. Then senegal was able to sneek a 3 point shot making it a tie at 64. Fans were at the edge of their seats when coach Chot Reyes decided for a time out at 33 seconds. Blanche and Tenorio were not abe to make a shot and missed, causing an overtime. With strict defence and quick shots both team were trying to out do each other, until all got into Alapag’s hands. He was able to shoot his last free throws, making the score 82-79. Andray Blanche and Jimmy Alapag led the team, scoring 18 points each during the game. 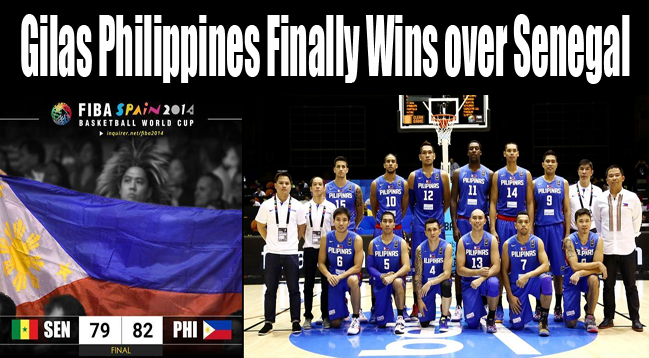 This is the first win of Philippines for the last 36 years. The game was on livestream brought to the Filipinos by TV5. The replay would be on September 5 at 11pm on TV5 and on September 6 at 7pm on Aksyon TV here.